At the moment I am working on another pair of socks and hope to get some pics up soon of the last two pairs that I finished. In between spells of knitting I am 'forced' to do housework and cook meals . . . . even bake the odd sweet or two. Lately I've made a couple of Washington Pies that didn't last long. Even the crows never managed a nibble off one of those. Poor crows . 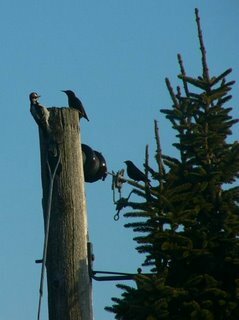 . . :-( . . . . they do have stiff competition with the ravens, and the grackels (sp? ), and the spruce partridges (Ruffed Grouse); not to mention the Wine Brook Cottage house residents who are in line ahead of them. Last April this woodpecker found that he may have to defend his right to peck on this pole for his breakfast. Looks like the 'Glarefight at Poletop' and it seemed a bit unfair as one was working as part of a 'tag team.' Interesting to watch the interaction of the birds; as well as most creatures. Cya later . . . .
Realllly nice. And that rule got thrown out the other day by someone who made something only out of tartan - and that looked really good. Lovely work! I'm not very good at rules, either, and your combination is lovely! 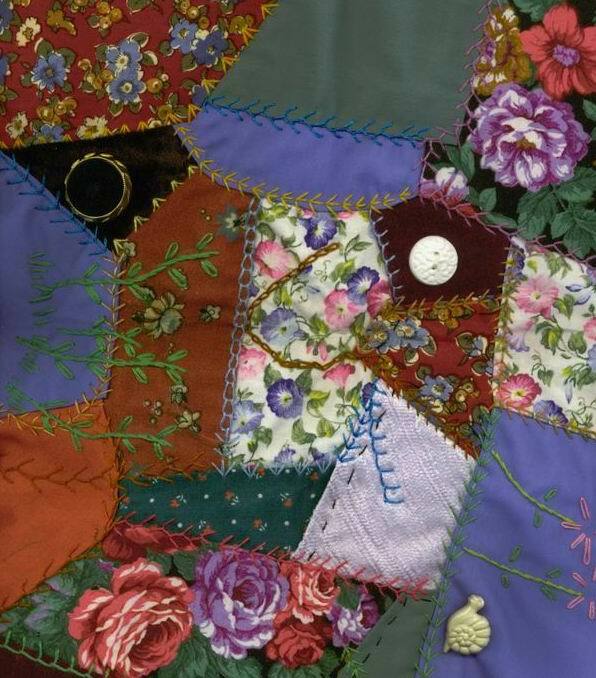 That quilt is beautiful...such wonderful handwork!! Rules, Schmules....ya done good! Love your cq block, the colours are so pretty. Forget the rules, they are there to be broken, if you like it then that's all that matters. PS What are Washington Pies?? Thanks Linda! Where can I find a picture of that 'something only out of tartan' please? Thanks Cyndy! I should say though that is only a small block; not an actual quilt size. Thanks Catherine! A Washington Pie is a two-layered white cake with icing and jam in the center and icing on top. Regardless of quoted rules (& I think it was me quoting :-) The block is looking GREAT Dawn! What an absolutely BEAUTIFUL quilt! Congratulations on doing such a wonderful job. May it be the beginning of many more.